Yellow-eyed mullet shoal by size. Smaller fish like this one just 60mm in length can be found in huge shoals over the summer around river mouths and along the coast. A smallish yellow-eyed mullet caught in the Waimakariri River. They seem to school by size. Sometimes you can catch quite a few big ones at the same time. They will readily take small flies as well as baited hooks. 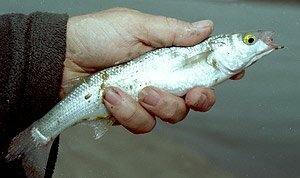 Yellow-eyed Mullet – Aldrichetta forsteri are a small inshore fish. A big one can reach 40cm. They like to feed on algae on rocks and will eat other small creatures that happen their way. Yellow-eyed mullet have small mouths so it is essential to fish for them with small size 8 hooks. If you find they are taking your bait without getting hooked try smaller hooks. Also, try lifting your rod tip when you feel them nibble the bait. I have found Kamasan size 10 Grubber hooks work really well. They will take just about any sort of bait. Saltwater shrimp, or yabbie, is the best bait of all. But they will take small cut fish baits, bits of worm, squid or even small rolled-up balls of bread. A bigger yellow-eyed mullet taken on a small bait fly. Fishing for mullet is greatly improved if you can toss berley on the water every few minutes to hold them in the area. Good berley can be made for mullet in a 20-litre bucket by mixing bread, blood and bone, fish scraps and the like together with water and stirring with a stick. Toss on the water a cupful at a time. 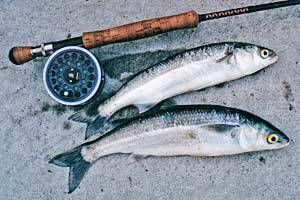 You can fish for yellow-eyed mullet from riverbanks, wharves, bridges and rocks in the tidal zone of rivers. I have caught them in the Kaiapoi River at the motorway bridge at least 5km from the sea. Yellow-eyed mullet move around quite a bit feeding mostly on algae. They can be found in the surf zone on ocean beaches, at river-mouths, coastal lagoons and they will travel quite some distance upstream within the tidal influence of coastal rivers. Six yellow-eyed mullet caught at once on a sabiki rig from a launch in the Marlborough Sounds. If you cast berley on the water you can often attract a whole school of mullet to your fishing position. This species is known as herring by many people. This is incorrect; they are not herrings at all. Fresh yellow-eyed mullet make excellent surfcasting bait, particularly for red cod. It also freezes well to be used later as bait. Big ones are very good butterflied open and cooked in the hot smoker. See catching yabbies to use for yellow-eyed mullet bait. Yellow-eyed mullet are sight feeders so it is important that the water is clear when you target them. Yellow-eyed mullet will readily take a small fly. They are great fun to catch on light gear. Yellow-eyed mullet (frequently and wrongly called herrings) are one of our most plentiful fish species. They are found all around the New Zealand coastline but are most abundant around the South Island. 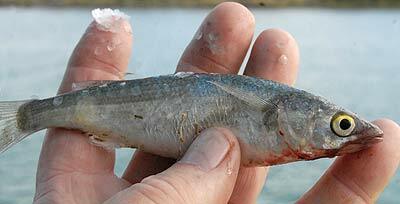 Although they make good eating, it is as a bait fish that they are most frequently sort. They grow to just over a foot in length. Yellow-eyed mullet are highly regarded as about the best bait you can get for catching larger species. A freshly caught mullet fillet, oozing with blood and juices, is irresistible to almost any fish in the sea. Snapper anglers often ﬁsh their yellow-eyed mullet baits whole, in order to ward off the attentions of pickers, such as spotties, which can have the annoying habit of eating all the bait from your hooks before a bigger and more desirable species can get a look in. Whole mullet baits are also excellent for catching skate, stingray and shark. These species find the humble mullet just the right size for a good mouthful. When ﬁshing for these, and other species with the whole mullet, a two hook rig is the best option, otherwise you’ll often find that the part of the bait that is taken, is the half without the hook. I have fished yellow-eyed mullet as live baits and found that barracouta will often chop them in two without being hooked. A two hook rig helps to solve this problem. six feet (1.8 metres) below the cork ﬂoat. Hook size,” around 6 – 8. line 12lb. red cod when surfcasting at night. slide to ﬁt different baits. Use Twist-Weld for the trace if fishing for, or expecting sharks. many species. For barracouta, the mullet must be alive! Red cod also find yellow-eyed mullet very tasty. I have spent many an evening at Birdlings Flat near Christchurch, surfcasting for red cod. As the sun starts to sink below the horizon the cod come on the bite. A fresh yellow-eyed mullet fished as a cut bait always outfishes other less desirable types such a squid. On many such evenings – and late into the night – I have out fished mates who were using other baits. There is just Something about fresh mullet that red cod can’t resist. Yellow-eyed mullet make good bait but so how do you go about catching them? The quickest, and usually most productive method is with a mullet net. I haven’t employed this method because I have never felt the need to. They are a lot more fun to catch on small hooks! However, friends who catch them with nets swear it’ s the only way to go. A sock net pegged out in an estuary can, at times, produce massive hauls of mullet. The idea is to set the net and then chase the little ﬁsh into it. Fishing with a sock net is a little like whitebaiting but on a grander scale. Mullet can also be caught in gill nets and drag nets designed for the purpose with one inch (25mm holes). Amateur netting has a bad press due to the incidence of nets becoming lost and yet continuing to catch fish. What a waste! However, I see nothing wrong with netting a few mullet to be kept as bait. I prefer the netting methods in which the net is attended constantly and is used only for catching bait, and then removed. 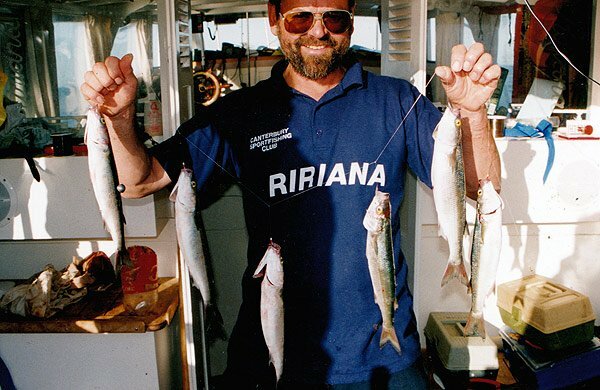 Fishing for mullet with rod and line ls a very rewarding and exciting form of angling. I have spent many an enjoyable couple of hours so engaged. You can see how its done on the video above. There are two methods that I use for taking mullet. One is to go down to the rocks and toss berley onto the water. Yellow-eyed mullet is a surface species and soon begin to appear in the wash. For berley, I use the minced remains of previous catches. I always keep fish heads, guts and so on in the freezer. Then I go down by the back fence – for obvious reasons – and put the lot through a hand-cranked mincer. This I then freeze into old plastic milk bottles saved for the purpose. I cut the top couple of inches off to allow for easier filling. I also put old bits of toast and bread crusts through to add a bit of bulk. Finally, after stirring in a little fish oil, I re-freeze the “berley bottles” for future use. One or two of these two-litre bottles are all that is required for an expedition to the rocks. I always take along a twenty-litre plastic bucket. When you arrive at your fishing possie, half fill the bucket with water and stir in the contents of the “berley bottles.” A cupful of this brew tossed onto the water every few minutes attracts the yellow-eyed mullet, sometimes by the hundreds. I’ve done this a few times up at French Pass, in the Marlborough Sounds, and managed to attract them in their thousands! Once they’re attracted by the berley I drop a ﬂoat rig onto the water, allowing the baited hooks to sink either under their own weight or with a couple of small split shot clamped to the line, just above the hooks, to take the bait under faster. As the mullet are by this time in feeding mode, almost anything will do to bait the hooks. I often use dough baits made with the addition of a teaspoon full of ﬁsh oil. It is usually possible to catch a couple of dozen in short order with this method – quite enough for a day’s surfcasting. The secret is to remember to keep sprinkling the “berley brew” over the water, otherwise, they soon lose interest and swim off in search of a meal somewhere else. My second method for catching mullet is to target them in the tidal reaches of a river, with live ghost shrimps for bait. Again the ﬂoat rig is used. The ghost shrimp is broken in two and each part passed onto a hook. The still wriggling shrimps are quickly devoured by the mullet who must be able to sense the movement of the shrimps in the water. I’ve tried worms dug from the garden and, although they work, they’re nowhere near as effective as the ghost shrimps. The ghost shrimps must ﬁrst be caught from the beach by the use of a bait pump. This is a large version of a bicycle pump made from P.V.C. or better still, stainless steel. You find their holes in the sand and extract them by suction with the use of the pump. They’re then stored in a bucket of water. They stay alive for several days and are without a doubt, the best bait for yellow-eyed mullet. Which of these two methods is best depends, to some extent, on where you live. If a suitable estuarine river is close at hand the later method requires less preparation as berley isn’t needed. Also, a riverbank is usually more accessible than climbing down onto rocks, to ﬁsh in the sea. The casting net about halfway to fully open. Another way of catching yellow-eyed mullet is with a casting net. As the name suggests this is a net that is cast out across the surface of the water. It takes a bit of skill and practice to learn how to use a casting net well but it is a skill well worth having. It is a very efficient method of catching mullet especially if you can concentrate them within easy range of the net by tossing berley out. I have on occasion caught a dozen yellow-eyed mullet with a single cast of the net. Whatever the method you use to catch your yellow-eyed mullet, ﬁshing for them is always good fun. Many times they’ve saved the day when bigger fish just weren’t biting. Sometimes you can hook an extra large mullet and, on light tackle they put up a good fight.